Continuing to write what I’m not supposed to be writing. This is rough, but it’s getting there. The title is taken from the words of the Cumaean Sibyl. So this eve I headed over to the ABC Studios at Southbank and had a chat with Waleed Aly and Wesley Enoch (Artistic Director of the Queensland Theatre Company). 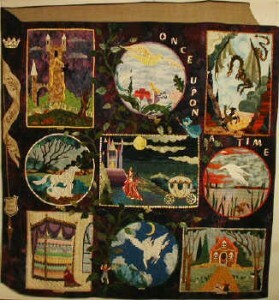 Another Chrissy Ellsworth piece, the cover for Shimmer‘s issue 4, 2006. 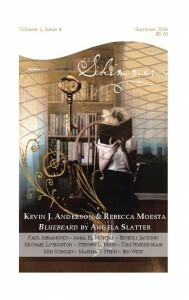 Illustrating my story “Bluebeard”, in that issue. … revisiting some art from the past. 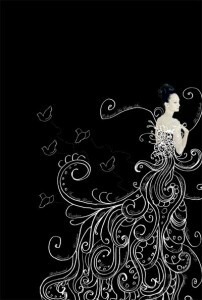 The lovely Chrissy Ellsworth did this gorgeous piece, which was used as the inspiration for my story “Dresses, three” that appeared in Shimmer‘s Art Issue in 2008 (methinks). 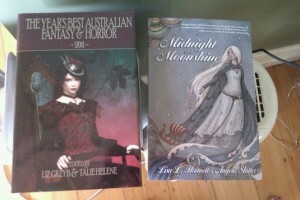 These arrived yesterday, the very beautiful Year’s Best Australian Fantasy and Horror 2011 (thanks, Liz and Talie and Russ), AND a pre-release copy of Midnight and Moonshine. 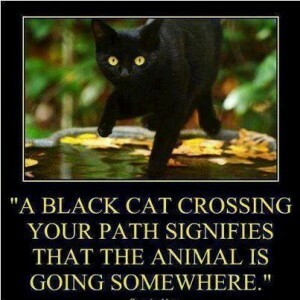 … I’m on The Rack. The lovely Jason Nahrung has reviewed Midnight and Moonshine over at ASIF (Australian Speculative Fiction in Focus). Huzzah!